Congratulations to the website owners who were biting their nails in anticipation because of the upcoming 4.0 search algorithm update. They can now sit back and relax, as Google has postponed the update till next year. 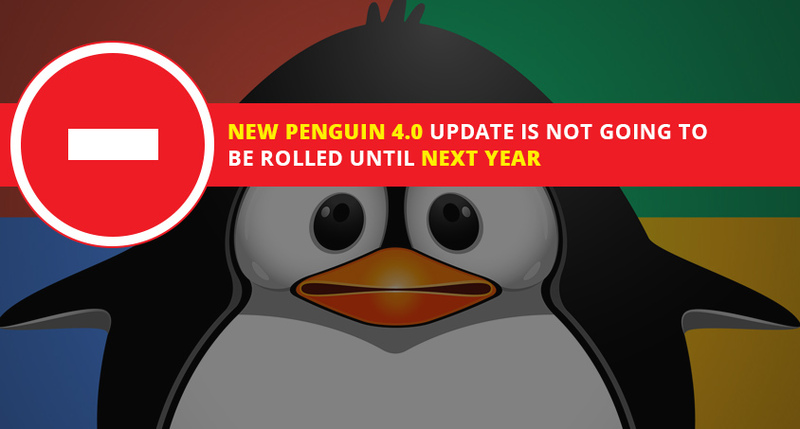 Google stated that due to the holidays, there won’t be any Penguin update till next year. Many Googlers are going on vacations, which includes including Gary Illyes who is responsible to unleash news, but Illyes also stated that they wouldn’t put out an incomplete algo. Going into the flashback, I would like to mention that the Penguin 3.0 update that was launched on October 19, 2014 affected less than 1% of US/English queries. But this time the update is expected to change how businesses are going to be ranked in the SERPs (Search Engine Result Page). As stated by many SEO specialists,It is stated to be a real time algorithm. After this update, Google itself will analyze and rank the links on the basis of algorithm. Also, the revamps or updated sites are also expected to be ranked after being found in heir new look. This feature will exponentially boost efficiency and save huge amountof time. It can also be said that all the well-optimized websites backed by good SEO practices will get positive results by the update, whereas the bad SEO tricks are going toface disastrous impact that will rank them down in SERPs. After Penguin update with real-time algorithm, spam links will be caught more quickly and higher the rankings of the websites in SERPs that really have very less or no ranking in the search results of Google.